2 . The training is made up of a number of presentations on various topics which include exercises and quizzes. There is a training handbook presenting course notes, example calculations and tables that the user can view and print out. Specific details of the course content is presented in the PDF brochure. The course is designed for Engineers and Designers who are responsible for the specification and design of bolted joints. This is a practical course, in that methodologies are presented for solving everyday bolting problems encountered in mechanical engineering. There is a course completion certificate available to those who pass an end of course test. 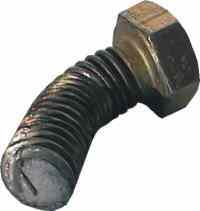 Threaded fasteners are a notable cause of service and other related problems. Besides possible safety implications, fastener failures can represent a significant proportion of a product's warranty costs. 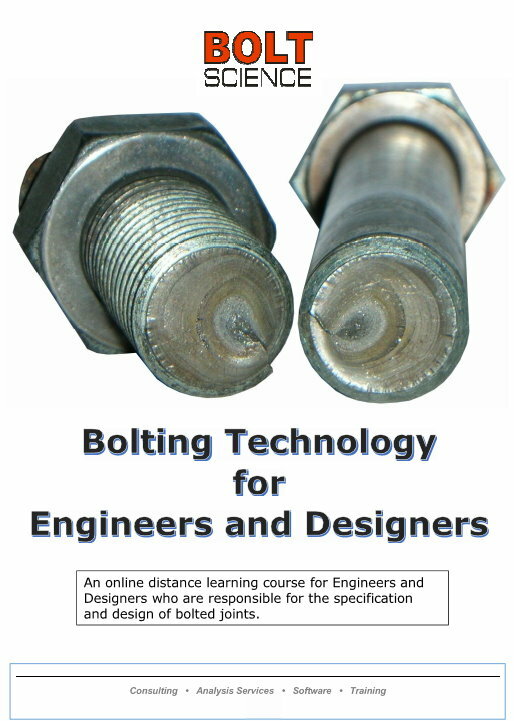 This online distance learning course presents key knowledge and facts to an Engineer to enable bolted joints to be designed and fasteners sized so that they will not fail. Engineers with responsibility for solving service problems. 1. Determine the appropriate size and strength of fastener to be used in an application. 2. 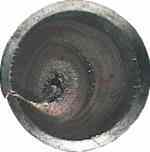 Understand the common modes of failures of fasteners and how each mode can be prevented. 3. Be able to calculate the loading acting on individual bolts given the forces acting on the joint. 4. Avoid the pain of making very costly, unnecessary mistakes when designing bolted joints. 5. Learn the differences between a manufacturing and design quality defect in relation to threaded fasteners. 6. Be able to determine the appropriate tightening torque to specify for a threaded fastener in a given situation. 7. Be able to establish the length of thread engagement needed to prevent thread stripping. 8. Be able to determine the forces acting on individual bolts when forces are acting on a joint. A training course handbook is provided as part of the training that can be viewed online and printed out, if required. The handbook contains background information to the material presented on the course, including derivation of the formulas, example calculations together with tables of thread stress areas, thread shear areas and fastener material strength details. Following presentation of the background theory, delegates are presented with problems relating to the topic. Full answers are provided in the course documentation. Background to modern threads - Whitworth, Sellers and metric threads. Fine and coarse thread and the advantages/disadvantages of each. The basic profile of Unified and metric thread forms. Thread tolerance positions and grades and tolerance classes. The stress area, what it is and how is it derived. The principles of bolt elongation, bolt stress and load. Yield, tensile strength and proof load properties. 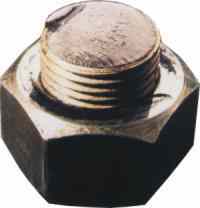 Details of common bolting specifications. Upper and lower strength limits for bolts. Stainless steel fasteners ISO 3506, Duplex and Super Duplex. Upper and lower temperature limitations of common bolting materials. The "Bolted Joint Enigma“ and why is tightening a bolt important? How a preload joint sustains an axial load. Joint separation – what is it and why is it important. Why tightening bolts is important for shear loaded joints. Explanation of why the bolt sustains a small proportion of an axial load. Overview of the ways threaded fasteners can fail. Thread Stripping Failures - internal and external threads. Bolt overload from applied forces. 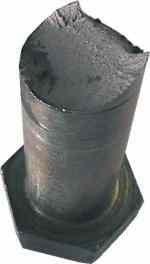 Bearing stress under the bolt head or nut face. Overview of the methods used to tighten bolts. Load-angle of turn graph for a bolt tightened to failure. Torque-angle tightening below the yield point. Projected angle tightening method below the yield point. Yield point tightening using incremental angle method. Yield point tightening method using slope measurement. Torque-angle tightening method into the plastic region. Yield control tightening plus an angle increment. Limited re-use of bolts sustaining plastic deformation. Bolt tensioning using hydraulic tensioning method. Tension indicating methods using load indicating bolts and washers. Use of ultrasonic's for bolt tightening. What are the consequences of not applying sufficient torque to a bolt. How torque is absorbed by a nut/bolt assembly. The relationship between the tightening torque and bolt preload. The factors which affect the torque-tension relationship. The nut factor method of determining the correct tightening torque. How to determine the appropriate tightening torque. Example calculation of how to determine the correct tightening torque. Scatter in the bolt preload resulting from friction variations. Determining the bolt preload (tension) resulting from a tightening torque. Prevailing torque fasteners and how it affects the torque distribution. Tests to determine the coefficient of friction of threaded fasteners. Non-rotational loosening (relaxation) and rotational loosening (self-loosening). Have an overview of the research completed over the last 50 years into establishing the cause of the self-loosening of threaded fasteners. Appreciate the forces that are acting on the threads that tend to self loosen a fastener. Why fine threads can resist loosening better than coarse threads. The inclined plane analogy. Learn about the work completed by Goodier and Sweeney into loosening due to variable axial loading. The work completed by ESNA and the theory of shock induced loosening and resonance within fasteners. The NASM 1312-7 vibration test for fasteners. Junker’s theory on self-loosening of fasteners and why fasteners self-loosen. The Junkers/transverse vibration test for fasteners. The influence that vibration amplitude has on the fastener self-loosening rate. Preload decay curves and the effectiveness of various fastener types in resisting vibrational loosening. The findings of Haviland and Kerley and how fasteners can come loose as a result of bending, shock or impact and differential thermal expansion. Conclusions from the research and how loosening can be prevented. Why are systematic methods important? VDI 2230 Background and range of validity. How to prevent the majority of bolting issues. Determining the maximum and minimum preloads. How to calculate the likely embedding loss. Establishing the axial force requirement. Establishing the shear force requirement. Ways in which a bolting design problem can be resolved. Example problems for the student to resolve. Difference between a friction grip joint a joint with bolts in direct shear. Bolts in direct shear or is a friction grip joint is more appropriate? Joints in single and double shear. The shear capacity of bolts in direct shear. The ratio of shear strength to tensile strength for steel. How to determine the shear strength of bolts in direct shear. Joints consisting of multiple bolts. Joints in direct shear and axially loaded as well. An explanation of what is fatigue. The causes of fatigue to be able to recognise this type of failure. Beach marking and why fatigue failures usually occur in the threads. The S-N diagram and the endurance strength of a threaded fastener. The load acting on a joint and that sustained by a bolt. Approaches that to establish the endurance strength of a threaded fastener. The effect that joint face angularity can have on the fatigue performance of a fastener. How the fatigue performance of a bolt can be improved. The effect that bolt diameter has on fatigue performance. Identify the cause of thread stripping. Be able to establish the shear area of an internal or external thread. How the tapping drill size affects the strength of the bolt thread. How the radial engagement of threads affects thread strength and the failure load. Use the information provided on the course to calculate the internal and external thread areas and the force needed to cause the threads to strip. Be able to establish the length of thread engagement needed to prevent thread stripping. Example problems are presented together with questions for the user to complete are provided – together with full answers. stripping calculations so that you have confidence to use them in practical applications. Background and explanation of galling. Types of fastener material and finishes susceptible to galling. Approaches that are used to prevent/minimise galling. What is meant by an eccentric shear load. Understand the slip process that can occur with shear loaded joints. Learn what is meant by the instantaneous centre of rotation for the joint. Be able to calculate the reactions of individual bolts when shear forces are applied to the joint. Perform example calculations so that you have confidence to use them in practical applications. Learn the methods that can be used to analyze joints subjected to combined tension and shear loads. Understand what is meant by prying and its effects. Included in the training are case studies. These case studies are drawn from various industry sectors. Catastrophic accidents have occurred as a result of the failure of bolted joints, they illustrate what can go wrong when bolted joints fail and what lessons can be learned. There is a course handbook provided as part of the training that can be viewed online and downloaded and printed. The course represents 20 hours of study (some people would complete in a shorter time, others longer depending upon their previous experience and knowledge). The course represents 2 continuing education units (based upon 10 hours of study per CEU). Access to the course will be available for three months following the login and password details being provided. Dr Bill Eccles is a mechanical engineer with 40 years experience in mechanical engineering with the last 20+ years specialising in bolted joint technology and analysis. He is a Chartered Engineer and a Fellow of the Institution of Mechanical Engineers and has a Doctorate in Engineering on the self-loosening of threaded fasteners. Bill has written several articles on bolting technology and has developed bolted joint analysis software that is used by major organisations around the world.